Year after year, teachers, librarians, and parents witness children who say they hate reading become engaged readers when they find the right book. To enjoy books, kids need to find the stories—fiction and nonfiction—that appeal to them. The following steps, also known as the “Four Ms”, can get your screen-loving children reading. * An eleven-year-old Minecraft addict spends hours on the Minecraft website reading about the latest “killer builds.” He also reads about a novel called Diary of a Minecraft Zombie, which is described on the website. During his next library visit, he picks it up and consumes it in one day. He then asks for the next book in the series. * A thirteen-year-old follows YouTube star Zoella’s blog. Besides begging her mother for a Zoella-inspired haircut and dip dye, she also asks for Zoella’s best-selling novel, Girl Online. After reading Girl Online, she requests Zoella’s second book. * A ten-year- old Star Wars fan loves visual dictionaries of the Star Wars characters and planets. After reading these ten times, he checks out and enjoys Timothy Zahn’s novels like Star Wars: Thrawn. Our kids watch us closely; they do what we do. The more interest and enthusiasm we show in reading, the better. Among the most powerful predictors of whether children will be frequent readers is whether their parents are frequent readers. In addition to reading a book, consider reading engaging newspaper or magazine articles in front of your child. They can be on any topic such as a review of the latest Jumanji movie, an article about a family dream vacation, or even a catalog. (Parents report that the Harley Davidson motorcycle catalog is a hit with preteen boys.) Read two or three paragraphs out loud to your child and talk about what you read. Try to do this at least every other day. Conversing about books connects us and makes reading even more fun. * Establish times when all screens are off. Some parents shut down the wi-fi at 7:30 or 8 P. M. in the summer or use a device like Circle by Disney, which limits the hours kids can use their screens. * Move at least three books that hook and/or magazines into your kid’s bedroom, bathroom, and any other place they frequent that doesn’t have a screen. Books that hook are the ones that engage your children’s interest and imagination. * Make sure there are a reading-wedge pillow and a reading lamp that can easily be turned off while lying reading in bed in your child’s room. Ideally, your child will fall in love with reading using the three steps mentioned above. The joy of reading another good book is their reward; there is no need for extrinsic treats. But what if you have a child who refuses to open a book? A reward of reading additional books is not going to motivate him or her. If that’s the case, you could consider offering a reading reward. * Require your child to “buy” his or her screen time: an hour of PlayStation for an hour of reading. Or how about a half hour of reading in order to watch an episode of Stranger Things? * Require that your kids earn—through reading multiple books —things they really want. This could include downloads, staying up late, video games, beauty products, homemade dinner requests, sports gear, or tickets to the movie version of a book. BIO: American author Kaye Newton loves to share valuable tips on how to get kids to put down their smartphones and pick up a book. 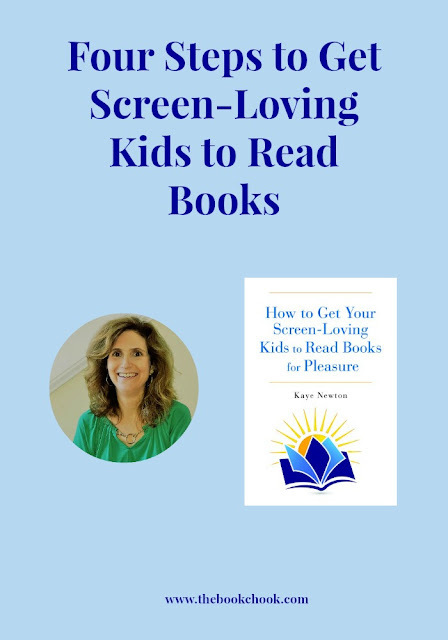 Kaye spent over a year researching expert advice about promoting reading, and road testing it on her three screen-loving children. Find out more about the result, How to Get Your Screen-Loving Kids to Read Books for Pleasure, and her other award-winning book at kayenewton.com.